Histidine is an important molecule in biology and pharmaceutical science. Metabolic block of histidine results in increased concentrations of histidine in blood, urine, and cerebrospinal fluid. Disorders of histidine metabolism is related to diseases such as histidinemia and urocanic aciduria. Histidine is a common ingredient of pharmaceutical products. 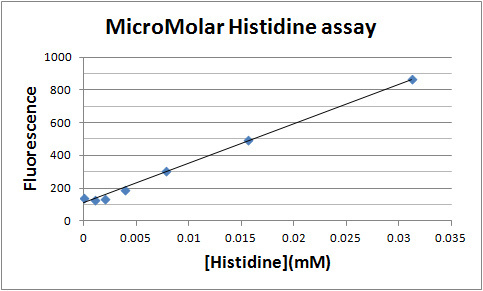 The MicroMolar Histidine Assay Kit (Catalog number HIS200) is designed for measurement of micromolar concentrations of histidine. The assay is based on increase of fluorescence at 535 nm of the dye C53 in the presence of histidine. The assay kit can be used for measurements histidine concentrations in biological samples, biochemical reactions, pharmaceutical products and environmental water samples. The assay is compatible with HEPES buffer, low concentrations of non-ionic detergent (<0.01%), MgCl2 (< 5 mM), CaCl2 (<5 mM), EDTA (< 1 mM) and phosphate (< 1 mM). It is not compatible with thiol compounds such as DTT. For measurement of other amino acids, see the information of Amino Acid Assay Kit (Catalog Number AAK1000). The MicroMolar Histidine Assay Kit (Catalog number HIS200) provides the reagent for measurement of 200 samples using 96-well plates. Cuvettes may also be used for measurements.